AM is excited to be one of the many sponsors involved in helping to spread the good word on the upcoming Beyond Eden New Contemporary Art Fair coming to Los Angeles Oct. 9, 10, 11. Beyond Eden is a multi-gallery event celebrating the new contemporary art scene in Los Angeles. Check out the full details, schedule and a great overview of the goals of the fair from Shana Nys Dambrot (THE Magazine, Flavorpill) after the jump. 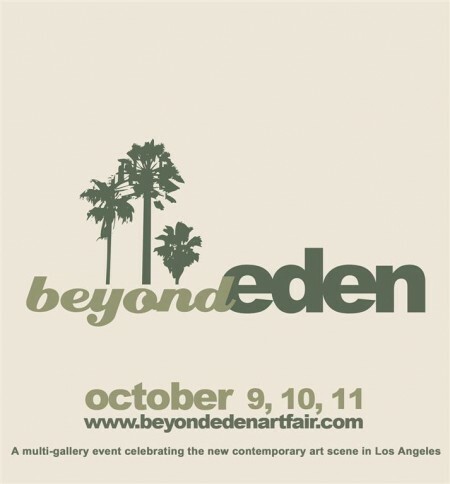 The Beyond Eden Art Fair is a multi-gallery event celebrating the new contemporary art scene in Los Angeles. The public is invited to attend this special event and admission is free. After the success of last year’s East of Eden exhibition which drew over 3,000 people, the organizers have decided to branch out the scope of the fair and expand the focus geographically to include galleries from all across Los Angeles. The goal of Beyond Eden is to celebrate the new contemporary movement that has been building momentum and a patron base in Los Angeles for the past several decades and is finally starting to receive mainstream recognition from major institutions and publications the world over. Organizers are partnering with some of Los Angeles’ leading cultural and community organizations to help broaden the scope of the event. A percentage of the event’s sales also will be donated to MOCA on behalf of the MOCA Contemporaries. The event organizers forecast this year’s event to be even larger and more well received and are expecting upwards of 5,000 people to pass through over the weekend. Beyond Eden will showcase the works of over 15 galleries and will be held inside the beautiful confines of the historic Los Angeles Municipal Art Gallery during the weekend of October 9th, 10th and 11th, with an opening night celebration planned for Saturday, October 10th. Participating galleries include Billy Shire Fine Arts, Black Maria Gallery, Carmichael Gallery of Contemporary Art, Copro Gallery, Crewest, DRKRM, Gallery 1988, Gallery Nucleus, La Luz De Jesus, Los Angeles Municipal Art Gallery (LAMAG), LeBasse Projects, New Image Art, Subliminal Projects, Synchronicity Space and Thinkspace. Artists included in the fair include The Date Farmers, WK Interact, Amy Sol, Junko Mizuno, Brett Amory, Brooks Salzwedel, Tin, Catherine Brooks, Ericailcane, Alexandros Vasmoulakis, Thomas Doyle, Nate Frizzell, Chris Peters, Sumi Ink Club, Know Hope, Man One, Morgan Slade, Sesper, Craig â€˜Skibsâ€™ Barker, Daniel Danger, Jason Hernandez, Joe Vaux, Ben Stone, Scott Campbell, Dabs & Myla, Marka27, Jane Stiles, Ken Garduno, Thais Beltrame, Krista Huot, Ekundayo, Mike Rea, Scott Radke and many, many more. Beyond Eden will also feature an “Artist Village” in the courtyard outside of the LAMAG in the beautiful confines of the Barnsdall Art Park. The “Artist Village” will feature an array of live painters curated by the featured galleries alongside installations from DeLab and Machine Projects plus live screen printing from P.U.M.A. Project and performance art courtesy of Cannibal Flower. Building on the overwhelming response to last year’s East of Eden locals-centric art fair, the organizers broaden the scope of this year’s much-anticipated sequel. They made great strides in codifying the invaluable contribution of LA’s East Side to the overall flavor of the city’s visual culture-and now with this year’s Beyond Eden, they prepare to take stock of that flavor across the entire spectrum of LA’s independent gallery scene. Analogous to that term as it’s used in the music world, independent or indie is as much if not more a state of mind and taste-a lifestyle, an identity-as it is a business level. This year the geography is conceptual and aesthetic, not literal. Participating galleries represent the most popular voices in the “new mainstream,” from Bergamot Station to Mid-Wilshire to West LA – Copro, Carmichael, New Image Art, Subliminal Projects, Black Maria, Thinkspace. At Beyond Eden the whole genealogy of galleries where this kind of work is most associated, nurtured and celebrated, all present their take on the no-name genre, and with 15 galleries side by side, the project is the perfect place for DIY scholars to work out their own definition of what the indie art world looks like now. LA is where everything starts; every trend is exported from the west coast. What was Helter Skelter here 15 years ago is the most mainstream thing imaginable these days. It’s all over the newspapers and big glossy monthlies, in the biggest galleries, on high-end clothing lines and vodka bottles, and museums around the world..
LA is a stage for emergence into the international art scene. More artists live and work here from around the nation and globe than any other global art center-at least it certainly feels that way. Maybe it’s the schools. Maybe it’s the film money, or the sunshine. Maybe it’s the illusion of eternal youth. The answer is not likely to be either simple or finite, but the question is certainly worth asking. Curious art-world minds want to know-what is it about LA that makes it so unique? Well, Beyond Eden is a great place to start. Narrative, figurative, poetic, even mythological at times, the indie LA art style is edgy and illustration-based, drawing on street-art forms like tagging and posting, with a taste for the vintage, for the seducing of the innocent, the facing down of monsters, the mastery of nature. It’s part surrealism, it’s omnivorous when it comes to source material, it’s cinematic, sci-fi inflected, rebel-embracing. It’s romantic sometimes, often beautiful to a point of vertigo. It’s all that and occasionally none of it. And now this loose affiliation of independent, alternative, post-Brow, avant-Brow, pop surrealist, urban romantics-whatever you want to call them is okay as long as it’s clearly outside the boundaries of the high-end, forbidding, over-priced, white-box fortress stereotype. 7-8PM: OPENING NIGHT KICK-OFF EVENT, benefiting the MOCA Contemporaries. Keep your eyes peeled to www.beyondedenartfair.com for all the latest as we head into the fair. Categories: Art, Contemporary Art, Shows & Events. Tags: Art Fairs, Beyond Eden, Contemporary Art, Show & Events.